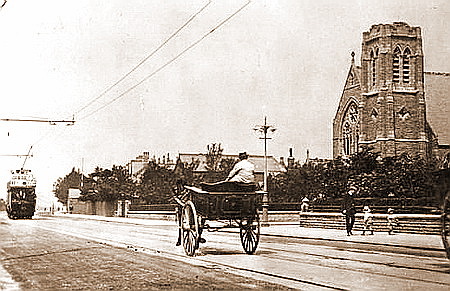 Clifton Drive North at the junction of St.George's Road c1910. In the distance a large wooden fence and behind it Porritt's Building Yard. 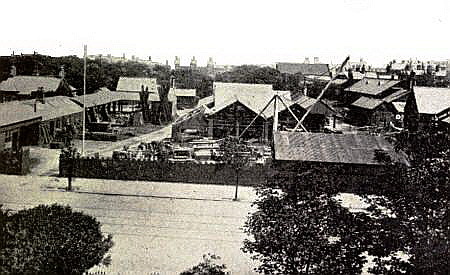 Porritt's Building Yard fronted Clifton Drive North and is today the entrance to Ashton Gardens. In 1896 the Land & Building Company offered the Gardens to the Local Board (Local Council), and they then comprised about twelve acres. In their letter to the Board they stated that £11,000 had been spent in laying out the Gardens. The Local Board, however, allowed the opportunity to pass by, although strongly advised to purchase by many leading residents. On the refusal of the Local Board to purchase, the late Mr. W. J. Porritt (grandfather of Mr. Oliver Porritt, J.P.), leased the grounds. Mr. Harold Porritt, some years later, invited local architects to prepare a scheme for building round a portion of the Gardens, retaining the centre, as an open space. Beach Road and St. George’s Square were therefore formed on what was previously a delightful part of the gardens.